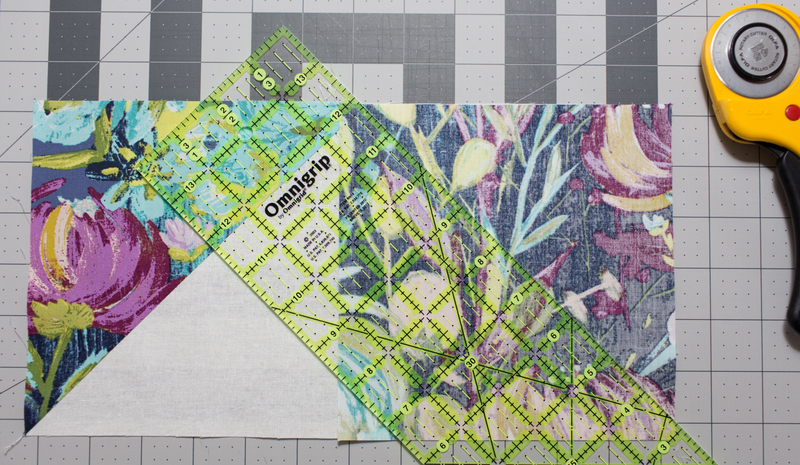 Welcome back to Week 2 of the Radiant Splendor Supersized Quilt-along. 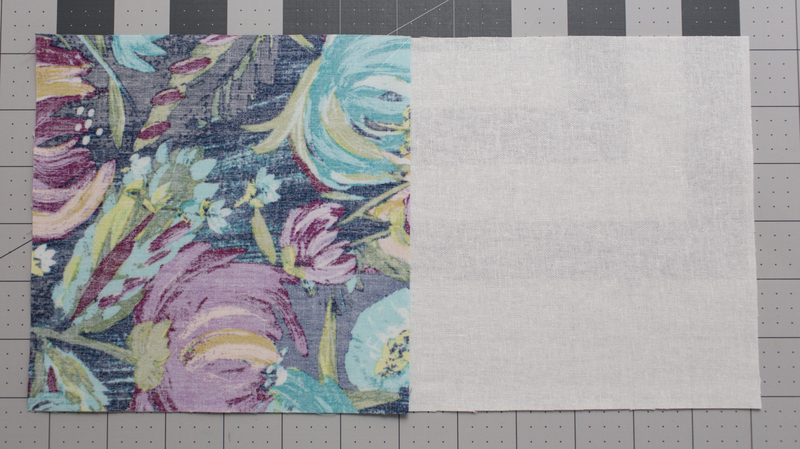 Last week, we discussed your Fabric Selection, Fabric Requirements, and Cutting Instructions. This week we are going to piece our block units. 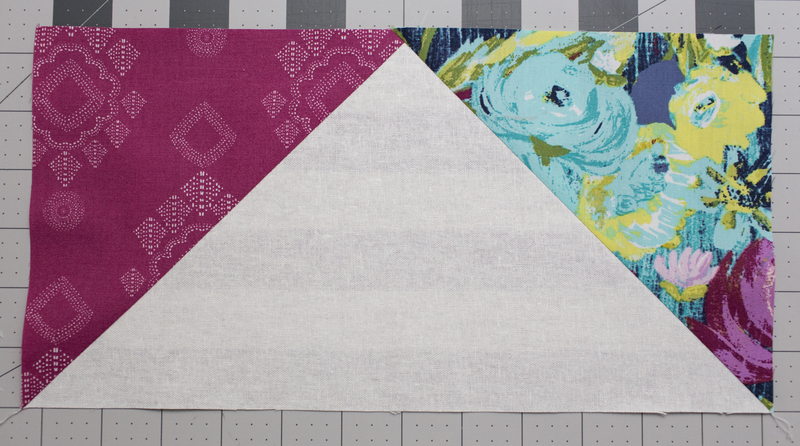 Step 1: Draw a diagonal line across the wrong side of (2) Painted Desert Night 6-1/2″ x 6-1/2″ squares. 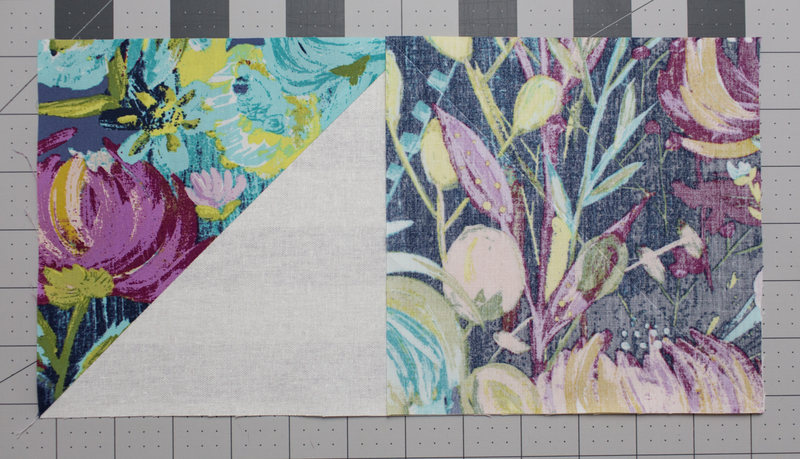 Lay (1) Painted Desert Night square right sides together with (1) Linen 6-1/2″ x 12-1/2″ rectangle, as shown. Sew on the drawn line. 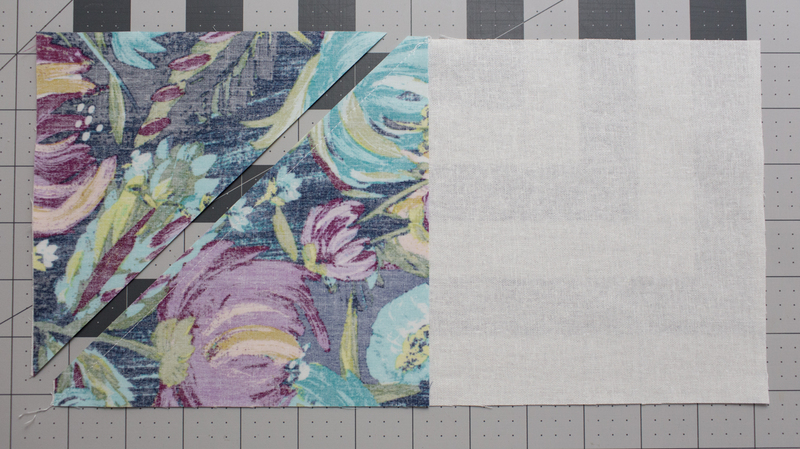 Step 2: Trim the excess fabric by cutting 1/4″ away from the stitching, as shown. Press open. 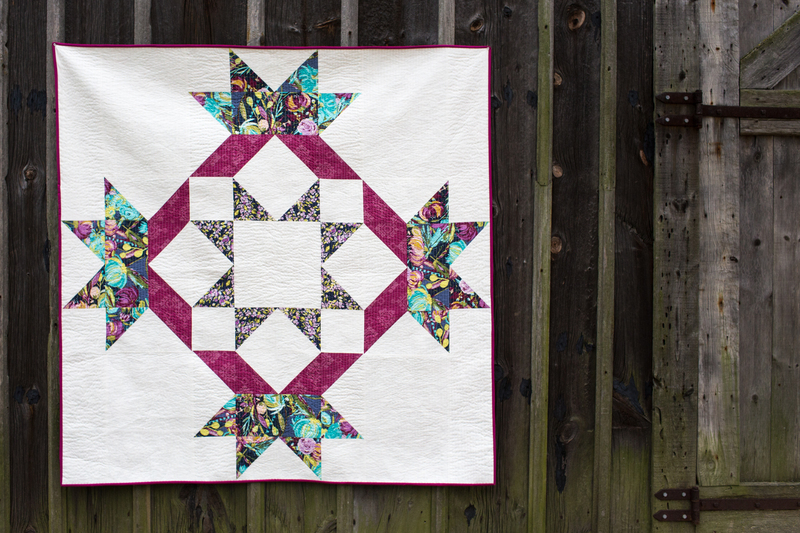 Step 3: Place the second Painted Desert Night square on top of the unit with right sides together. 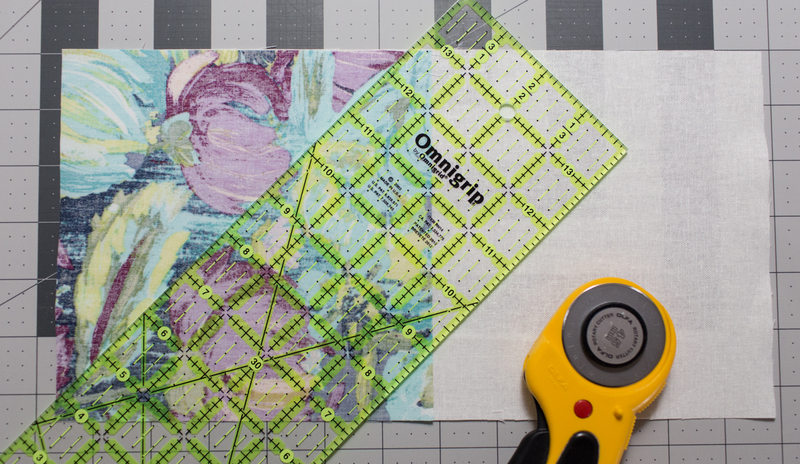 Sew on the drawn line and trim the excess by cutting 1/4″ away from the stitching, as shown. Press open. 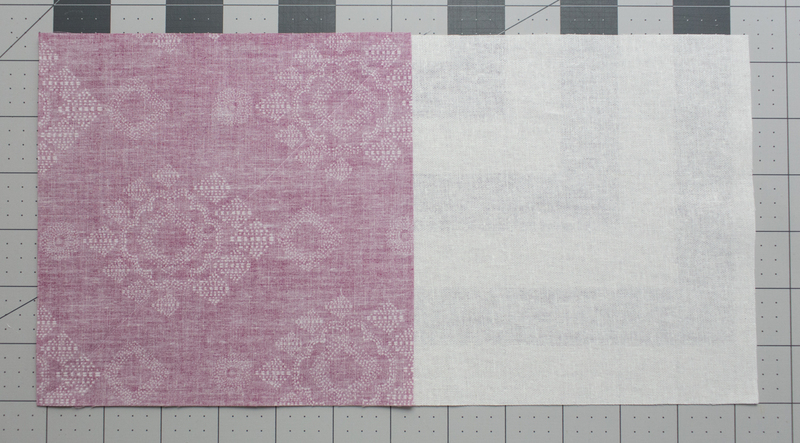 Step 4: Repeat steps 1 – 3 to make (4) Painted Desert Night/Linen Flying Geese units. 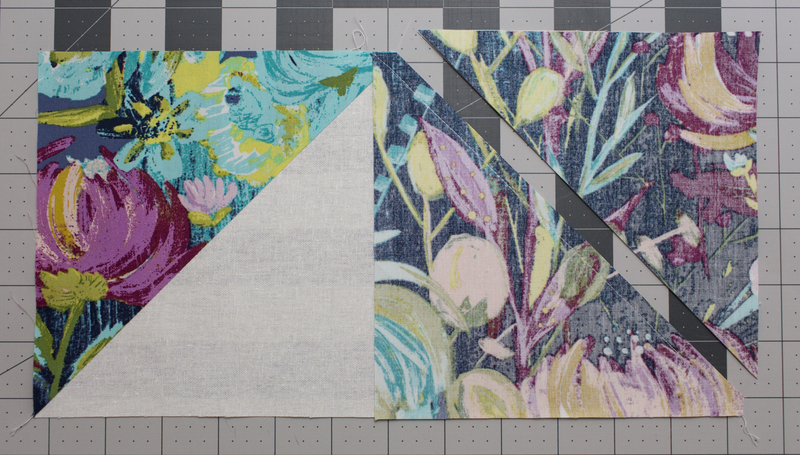 Step 5: Repeat steps 1 – 3 again, this time using the (8) Stitched Diamant Verve 6-1/2″ x 6-1/2″ squares, to make (4) Stitched Diamant Verve/Linen Flying Geese units. 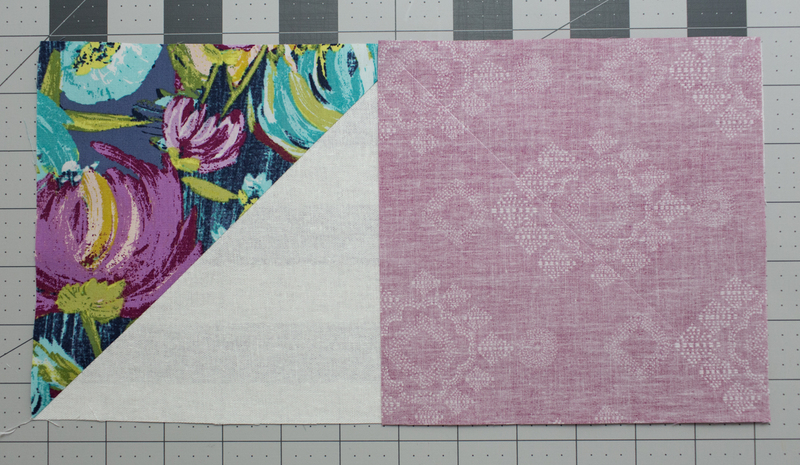 Step 6: Repeat steps 1 – 3 again, this time using the (8) Bougainvillea Lilac 6-1/2″ x 6-1/2″ squares, to make (4) Bougainvillea Lilac/Linen Flying Geese units. 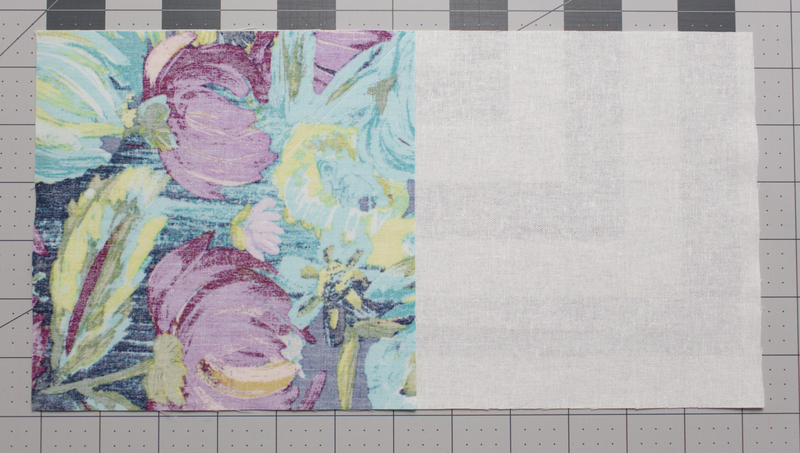 Next we will make the flying geese units from a combination of Painted Desert Night and Stitched Diamant Verve fabrics. 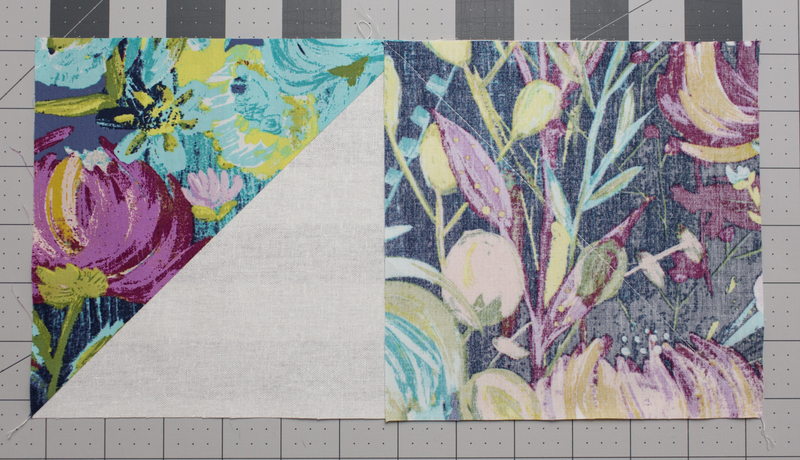 NOTE: Fabric placement is important when making these flying geese. 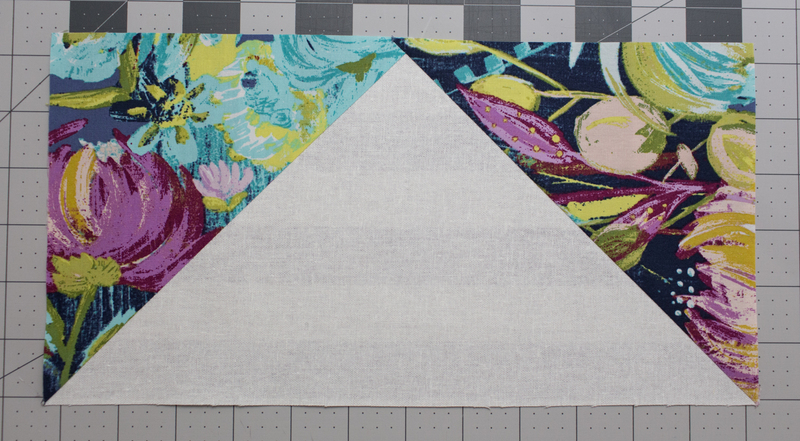 Step 7: Select (1) Painted Desert Night 6-1/2″ x 6-1/2″ square, (1) Stitched Diamant Verve 6-1/2″ x 6-1/2″ square, and (1) Linen 6-1/2″ x 12-1/2″ rectangle. Draw a diagonal line on the wrong side of the squares. 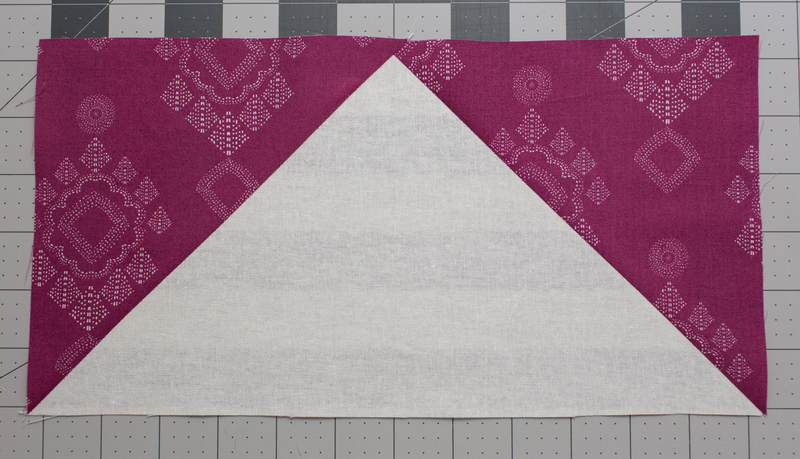 Lay (1) Painted Desert Night square right sides together with the LEFT side of the Linen 6-1/2″ x 12-1/2″ rectangle, as shown. 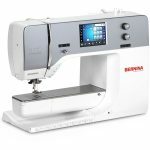 Sew on the drawn line. 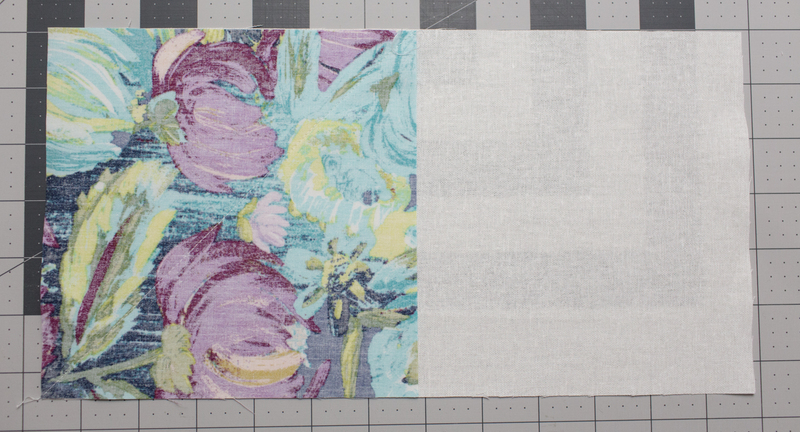 Step 8: Trim the excess fabric by cutting 1/4″ away from the stitching, as shown. Press open. 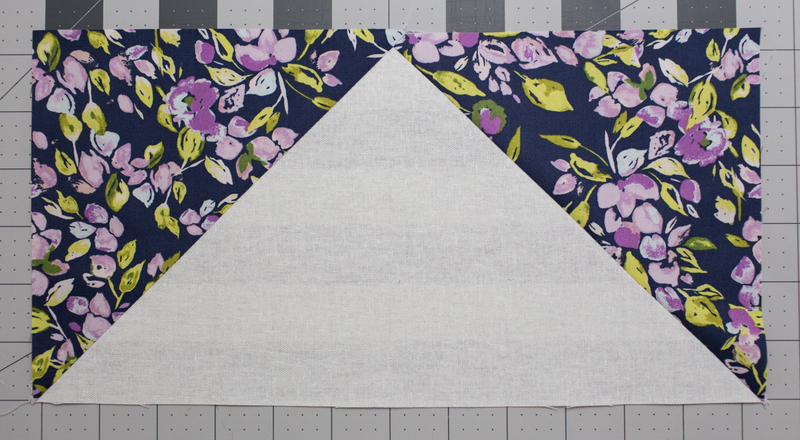 Step 9: Lay (1) Stitched Diamant Verve square right sides together with the RIGHT side of the Linen 6-1/2″ x 12-1/2″ rectangle, as shown. 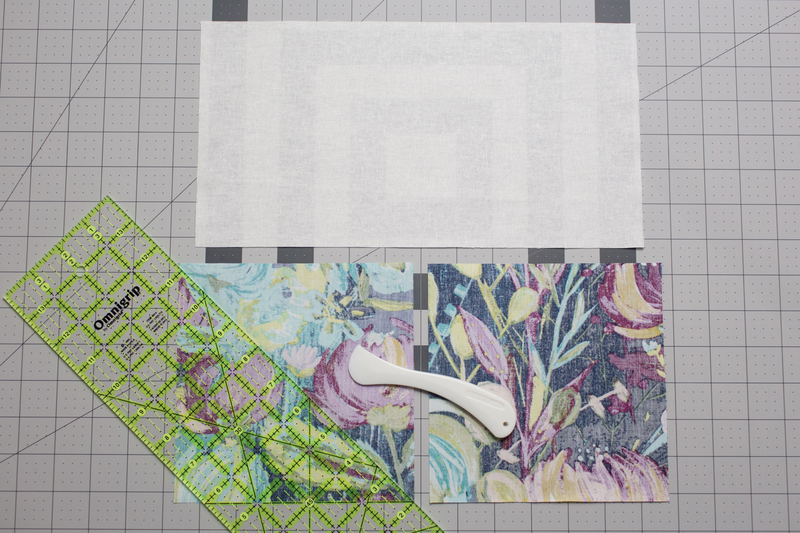 Sew on the drawn line and trim the excess by cutting 1/4″ away from the stitching, as shown. Press open. 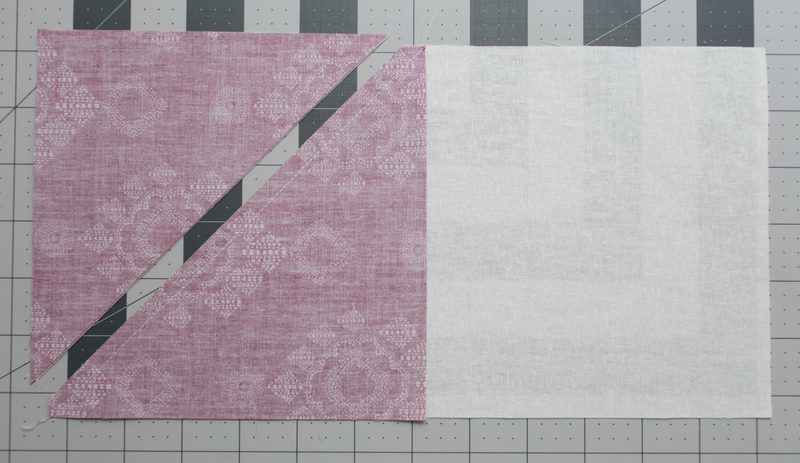 Step 10: Repeat steps 7 – 9 to make (4) Painted Desert Night/Stitched Diamant Verve/Linen Flying Geese units. 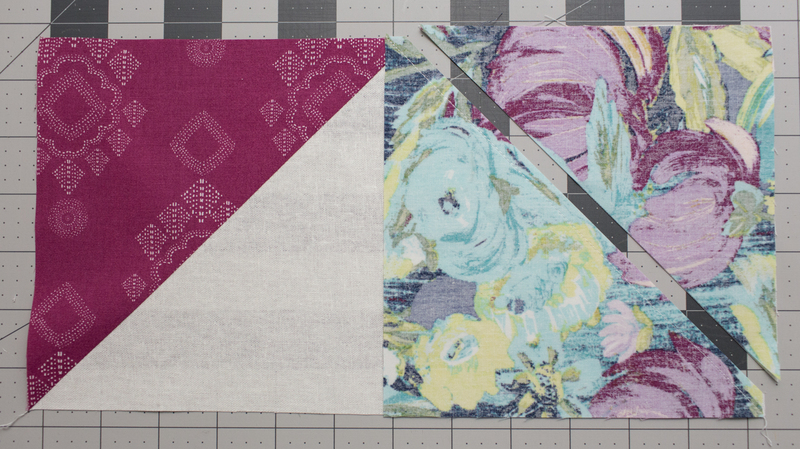 Now we will reverse the placement of the squares when making our flying geese. 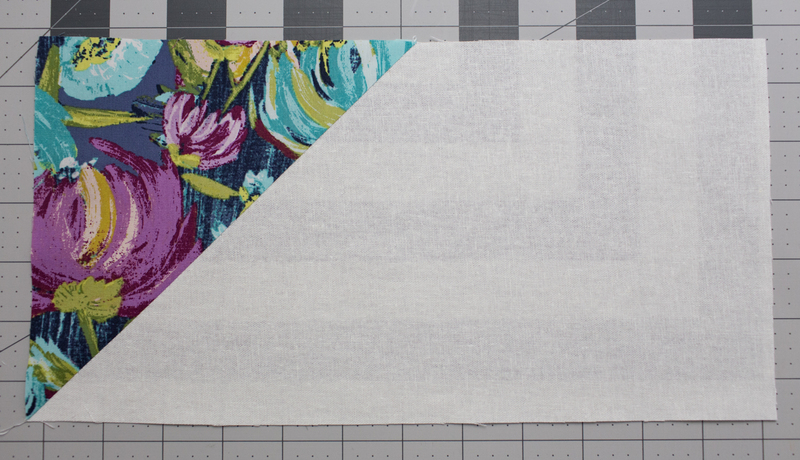 Step 11: Select (1) Painted Desert Night 6-1/2″ x 6-1/2″ square, (1) Stitched Diamant Verve 6-1/2″ x 6-1/2″ square, and (1) Linen 6-1/2″ x 12-1/2″ rectangle. 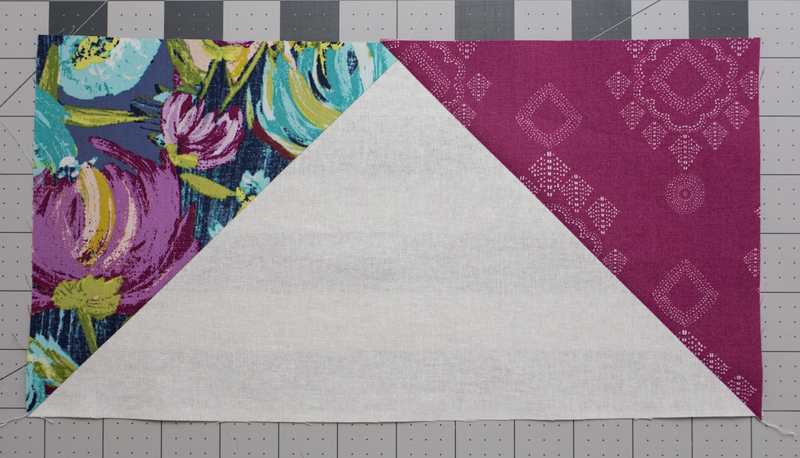 Draw a diagonal line on the wrong side of the squares. 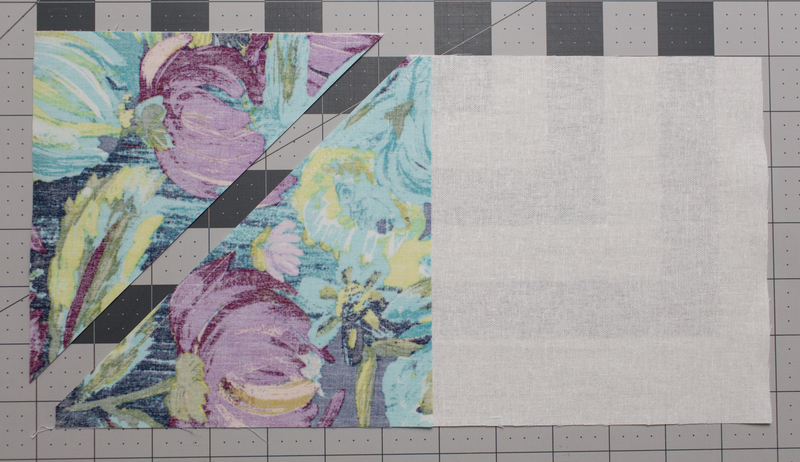 Lay (1) Stitched Diamant Verve square right sides together with the LEFT side of the Linen 6-1/2″ x 12-1/2″ rectangle, as shown. 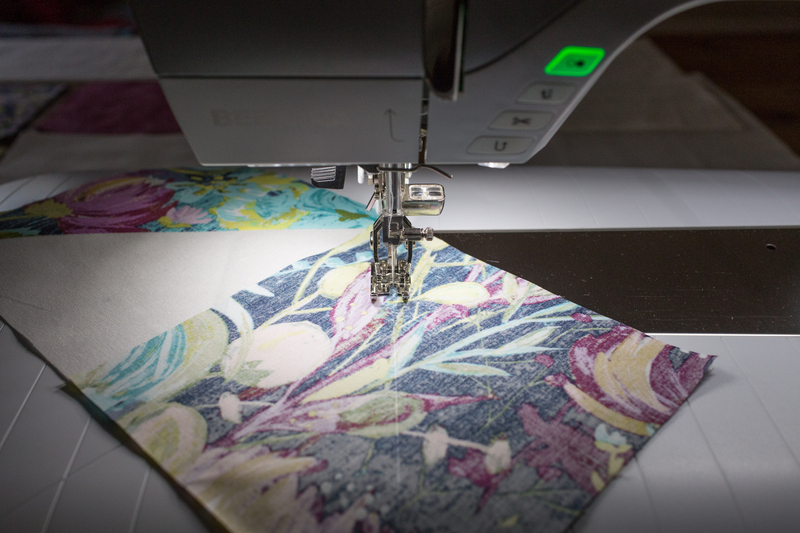 Sew on the drawn line. Step 12: Trim the excess fabric by cutting 1/4″ away from the stitching, as shown. Press open. 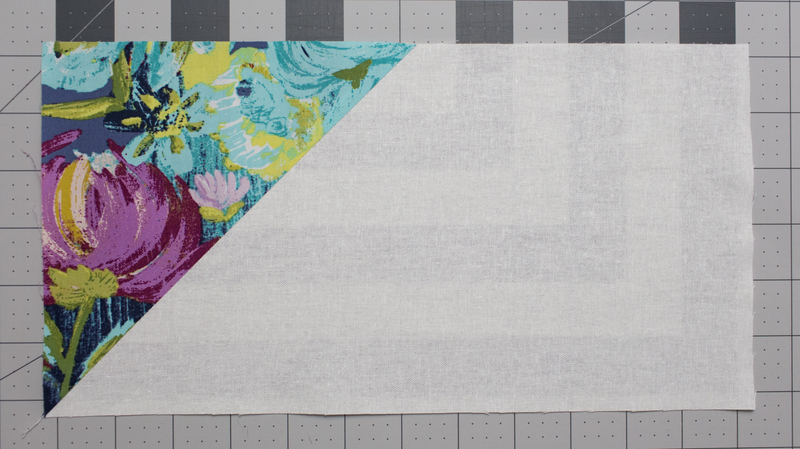 Step 13: Lay (1) Painted Desert Night square right sides together with the RIGHT side of the Linen 6-1/2″ x 12-1/2″ rectangle, as shown. 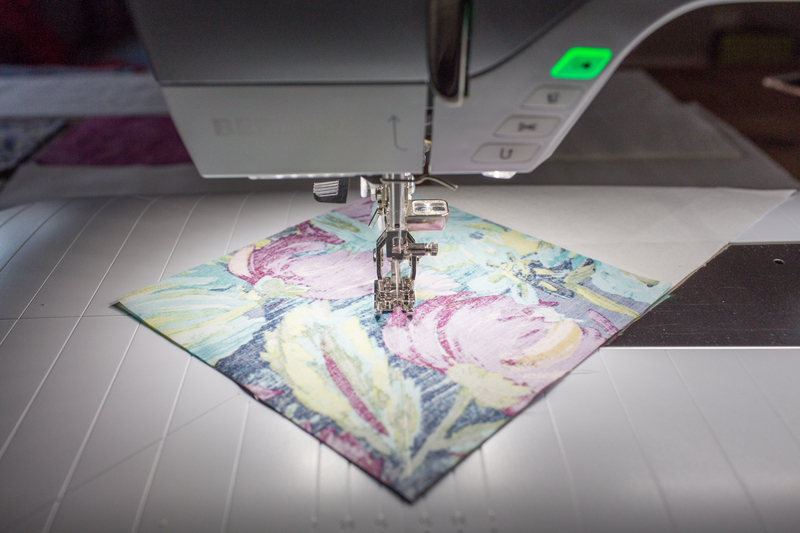 Sew on the drawn line and trim the excess by cutting 1/4″ away from the stitching, as shown. Press open. 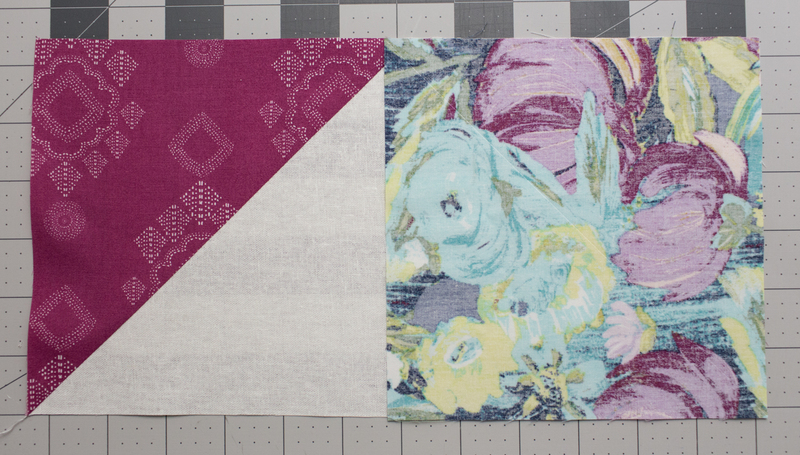 Step 14: Repeat steps 11 – 13 to make (4) Stitched Diamant Verve/Painted Desert Night/Linen Flying Geese units. 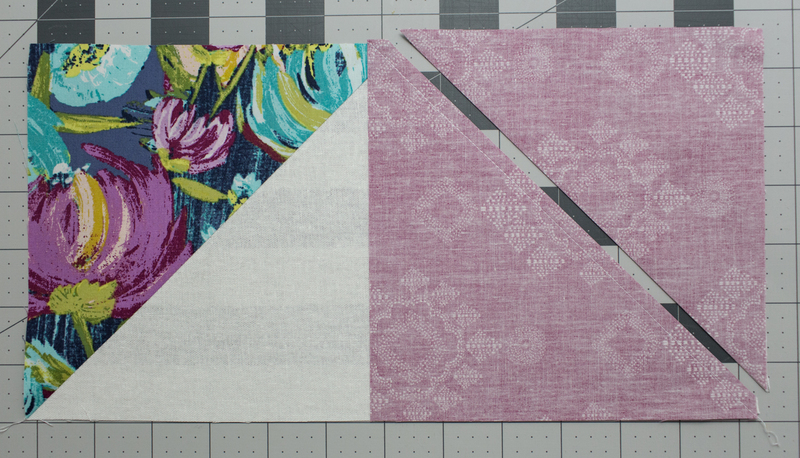 Stop back next week when we will put these units together to complete our quilt top!